This topic should be called Seagulls suitable for boats. 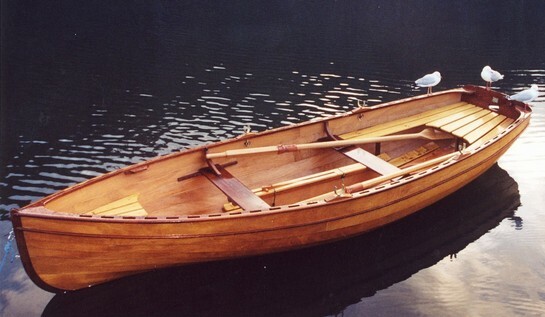 My question: would a 40+ be powerful enough for a Tammie Norrie (a 4.11m/14 Ft wooden rowing-boat)? I'm considering building this one. Re: 40+ suitable for Tammie Norrie? Be fine in still water though might be struggling in a head wind or against a tide. I think a century or 102 would have a better resonance with that fine vessel. 40's are bit too high pitched for me though light for handling which is a bonus. I'll second Yugo's advice 40 series give out nearly as much umph as a bigger seagull, but lack the larger prop for driving through waves etc. Nice boat, but if you are not intending to sail I would leave the centre board out and fit a decent keel, better for both rowing and motoring. Thanks for the response. The boat on the photo is just an example, "stolen" from the internet. I will leave the centreboard out and build it as a rowing-boat. 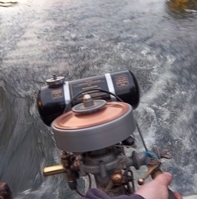 I will use it only on small to medium sized lakes and canals in Holland. I have a nice 40+ long shaft in good working condition and recently I prurchased a 102+ clutched as a restoration project. Yesterday I laid hands on a ready built Tammie Norrie (4.11 m LOA) to be powered by my Seagulls. It is now a sailing dinghy but I may convert it into a rowing boat. It needs some TLC too but is in good condition. I hung the 40 Plus Long Shaft on it, but have no opportunity to launch her yet and try. Do you think the exhaust will be too deep in the water? The tape indicates the waterline. My 102 will go one inch deeper.